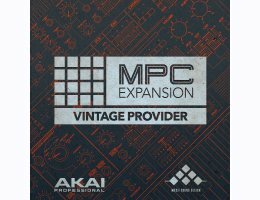 AKAI Professional & MSXII Sound Design are proud to bring you a favourite in their MPC Expansion Instrument Series sound packs. Vintage Provider is the perfect instrument pairing partner to the critically acclaimed Soul Provider MPC expansion. It brings a plethora of vintage synthesized bass, leads, pads, plucks, stabs, and even rhodes to your MPC library. When you need THAT sound, look no further, MSXII Sound Design & AKAI have you covered. Vintage Provider is laced with a blend of new and vintage, acoustic & synthesized instruments from yesterday & tomorrow. Each sound has been carefully sampled and created using complex FX chains; providing users with an authentic, soulful, & MSXII Sound. There are also added lush reverbs, tasteful LFO modulation, and stereo widening chorus & delay FX which will get you from an initial idea to beat-making creativity in no time! Once again, Vintage Provider is built based upon sounds that have stood the test of time and defined an entire genre of music. This delivers with an authenticity that is unmatched! As usual, AKAI, alongside MSXII Sound Design, provides you with only the best and most uniquely authentic sound set available. Each instrument program has been expertly designed to instantly inspire you no matter what music making mood you're in. AKAI Professional MPC hardware/software is required.